I had so many pictures from Saturday at NYCC, we're getting a second post. Here we go! Is it just me, or are Ghost Rider costumes really killing it over the last few years? Costuming in general has gotten a lot more professional-level, I guess, but I see more incredible Ghost Rider costumes than any other. Which one is this one, Johnny Blaze? At the Tick booth, I ran into Barry Josephson, one of the executive producers on the current Amazon show! I, uh, gave him some pins. Then I saw Tiffany Smith! I know her as a movie critic from various Rotten Tomatoes panels, but she's also an actress and show host! Dr. Doom soon passed by. The guy in the background seems wary, as he should be. The NYCC Tick issue debuted here (naturally), and here I am to the side of the New England Comics booth with artist Ian Nichols. Some VIP members came to the booth (as seen in the background) so we moved aside for a while. And then I saw Jennie Wood! We had to discuss a signing on Sunday, and you'll see pictures from that...when I post Sunday's pictures. Working my way out toward the concourse area, I saw this great She-Ra interactive display, and also this fan dressed as the Sorceress! Since I had a few minutes, and because it looked so great, I decided to check out the display. The lines were confusing and I very well might have (unintentionally, I promise) skipped a major backlog of people waiting to see this. I of course remember He-Man and the Masters of the Universe fondly from my 1980s childhood, but I never had any strong feelings about She-Ra at all. The walk-through was fun and we got some pins and other convention swag, and it convinced me to check out the show, even though I was sure it would be aimed at a younger audience. And then I watched the show and loved every minute of it. It's a great show and absolutely worth seeing if you haven't yet! The show ended for the day soon after, but I managed to get a few more pictures of people in costume on this, the busiest day of the event. Here's Hellboy! Ant-Man and Infinity War-era Spider-Man! This person was ahead of the Spider-Verse game. Those octopus arms had to be cumbersome. Is that a Mortal Combat/Green Lantern mashup? Weird. This gentleman greeted me as I waited outside of a restaurant to eat dinner. Any 2099 costume is a good costume. I wrote about this in January, but after dinner, I took off to find the Baxter Building! I might have crashed a fancy party at Rockefeller Plaza. On the way back to catch the train, I walked by NBC Studios and someone made fun of me for getting a picture here. It might have been SNL backup band members. That's okay - I had a Fantastic Four shirt on and was carrying convention items. I realize I looked like a tourist. I regret nothing. I'll post Sunday's pictures soon! Original art from the wedding of the Thing and Alicia! 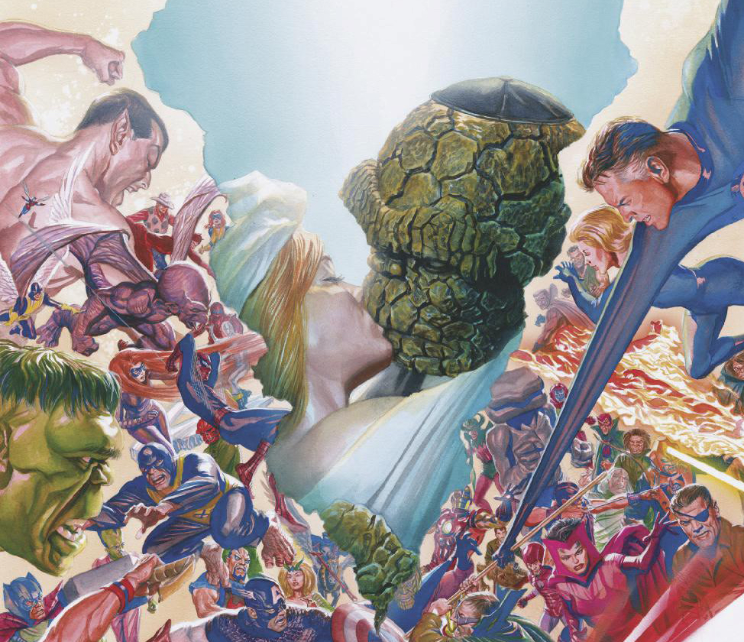 In December, 2018, in the pages of Fantastic Four #5, Ben Grimm and Alicia Masters finally got married! When I read the issue, I said to myself, "if the artist ever sells pages from this issue, I need to get one." Well, Aaron Kuder, the book's regular artist, put a bunch of pages from this issue on sale recently and I jumped at the chance to get one. Let's take a look! 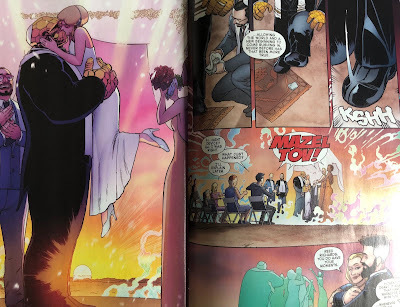 This is page 58 of the oversized issue, and this particular page happens immediately after Ben and Alicia share their "you may now kiss the bride" moment. Kuder both pencilled and inked the page, so I didn't have to choose between one and the other. Ben and Alicia have been destined for each other since Fantastic Four #9 (1962), so it's great to see them finally tie the knot, more than 50 years later. One of the covers for the issue (by Alex Ross, pictured below) was an homage to FF Annual #3, which featured the wedding of Reed and Sue. 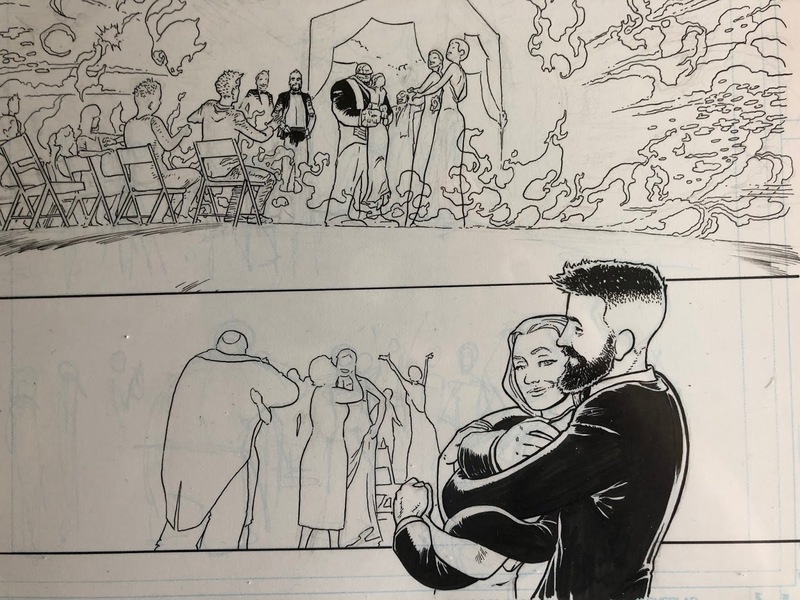 At the bottom half of the page, we can see quite a few other supporting characters, including Reed, Sue and Johnny, Alicia, Franklin, Valeria, Aunt Petunia and more! 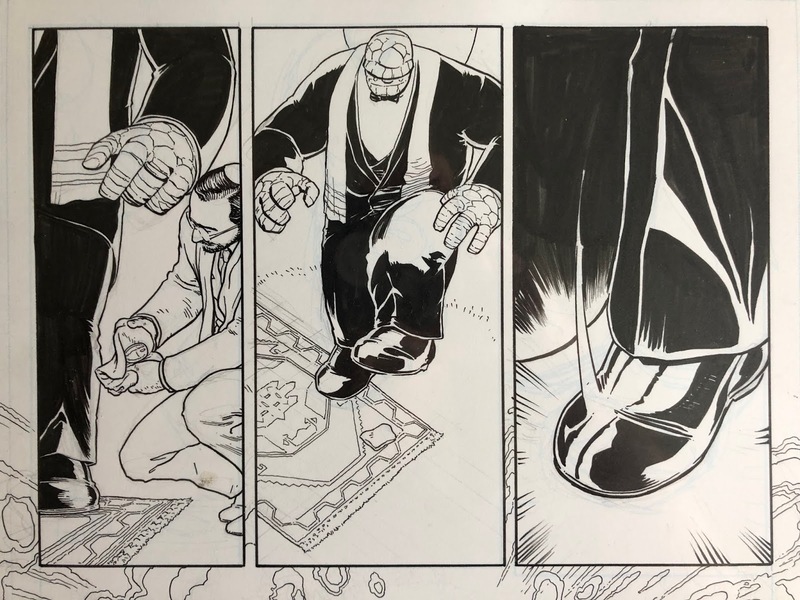 I kinda never thought I'd be able to buy artwork from such an important issue in the life of the Thing, but the page I bought was surprisingly affordable and I managed to grab it before someone else came along. 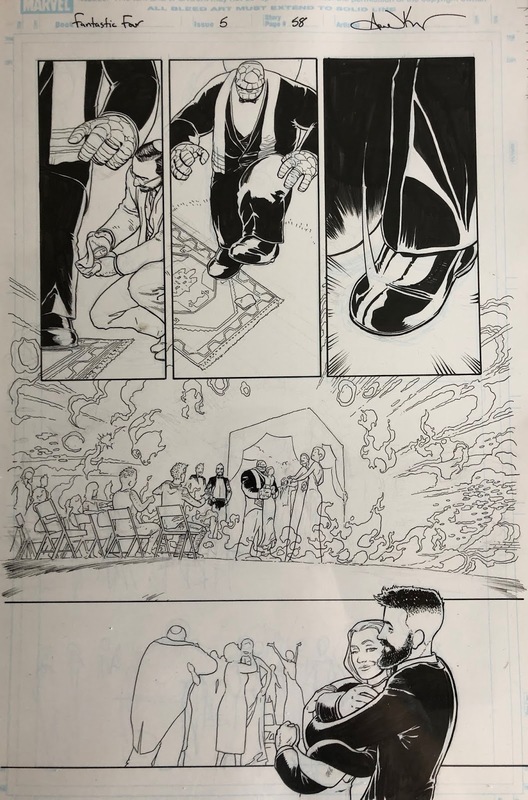 This is a great page and I'm so happy to have it! And they lived happily ever after. It's clobberin' time.